Costa Rica is renowned for its rainforests and beaches. On this fabulous Costa Rica ecotour, that's where you'll spend every minute. You'll witness first-hand the country's success in protecting its endangered species in visits to two diverse national parks and wilderness reserves. 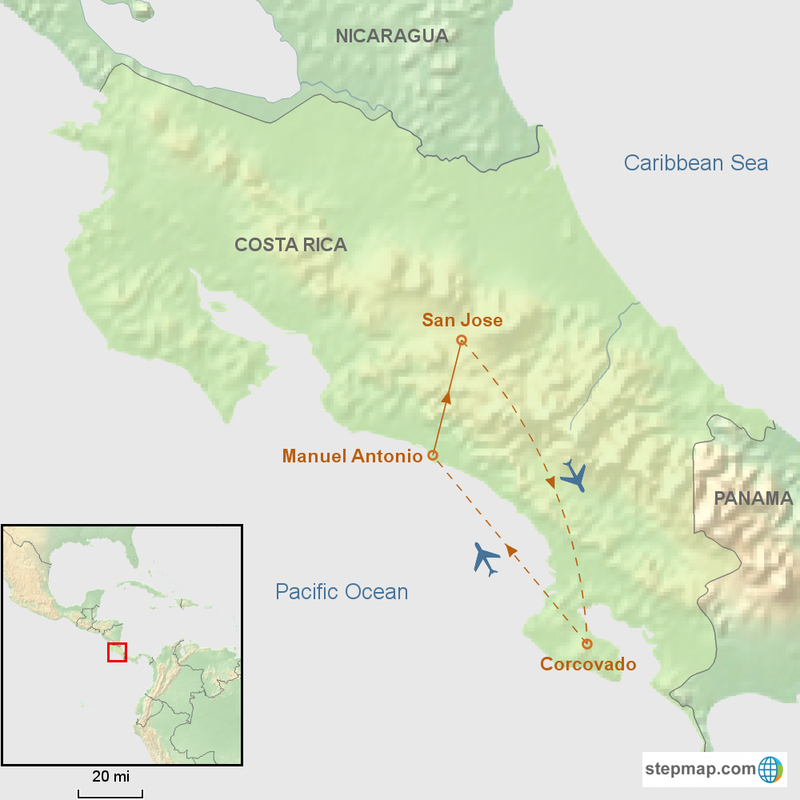 Travel to Corcovado National Park where monkeys, jaguars, tapirs and scarlet macaws await you and enjoy the white sand beaches of Manuel Antonio National Park. Experience the thrill of whitewater rafting from the mountains to sea level, surrounded by coffee plantations and lush tropical jungles. This is an unforgettable Costa Rica adventure. Arrival at the San José International Airport where a Southern Explorations representative will be waiting to transfer you to your hotel. Overnight at a hotel in San Jose. Before noon (depending on the tides), you'll board a speed boat before noon to reach Palmar Sur for a short flight or two hour drive to Quepos where you will be transferred to your hotel. Spend this afternoon of your Costa Rica adventure at your leisure, exploring the beaches and charming town of Manuel Antonio. Overnight at a nearby hotel. (B) NOTE: Manuel Antonio National Park open every day Dec 1 – June 30 and closed on Monday July 1 – 30.